Yekaterina Glazko (“Kate” to her friends) has been involved with Mozilla since 2014. She is from Los Angeles where she is a student of Computer Science and Business Administration at University of Southern California. Kate is interested in robotics and multimedia. In her spare time, she enjoys playing lacrosse. Kate Glazko is from United States of America in North America. Hi Kate! How did you discover the Web? The web has been a necessity for me since I was a kid. I used it to do research for school and to connect with my friends. I’ve been using Firefox for a while now; however, I really became a loyal user after my testing internship at ReachLocal in 2013. After researching Firefox some more, I also became a big fan of Mozilla’s mission! My internship at Mozilla in summer 2014 got me in touch with some community contributors at Mozilla. It was inspiring to see how much people contributed even while having other jobs! I decided that I would continue working on Mozilla Quality Assurance projects after my internship. 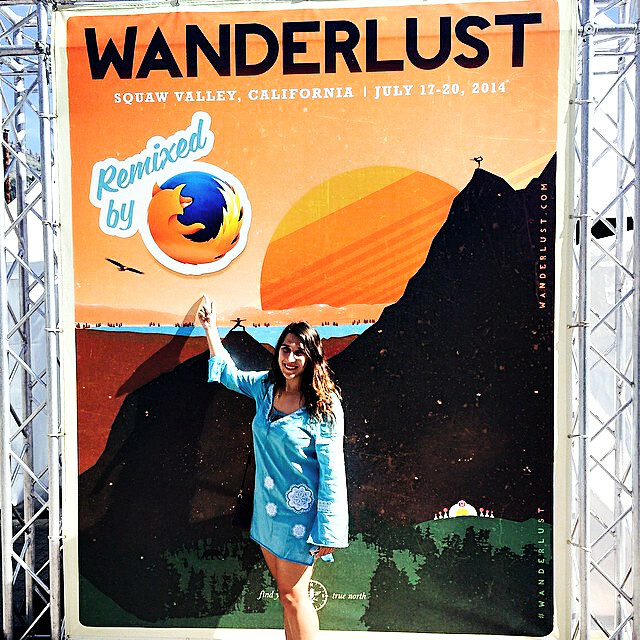 Kate Glazko as a volunteer at the Mozilla booth at Wanderlust Tahoe yoga and music festival held in Squaw Valley, California from July 17 – 20, 2014. I’ve written a couple of apps for Firefox OS: Fox Facts and Test Silent Alarm Daemon. I’ve participated in a variety of hackathons organized by local schools where shared with teams how easy it is to create a Firefox OS app from a mobile-first web app. 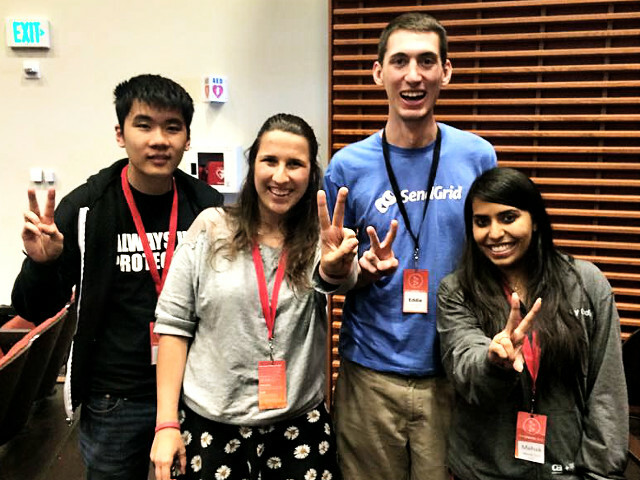 Kate Glazko, Akhilesh Saklecha and Roy Zheng won the 2015 U.S. SS12 Hackathon Championship with StealthFly, a mobile game playable by the visually impaired via the Apple App Store, Google Play and Amazon Appstore. This semester, I am mentoring female high school students of Computer Science. I’ve been introducing them to Mozilla One and Done as an easy way to get involved in Open Source. 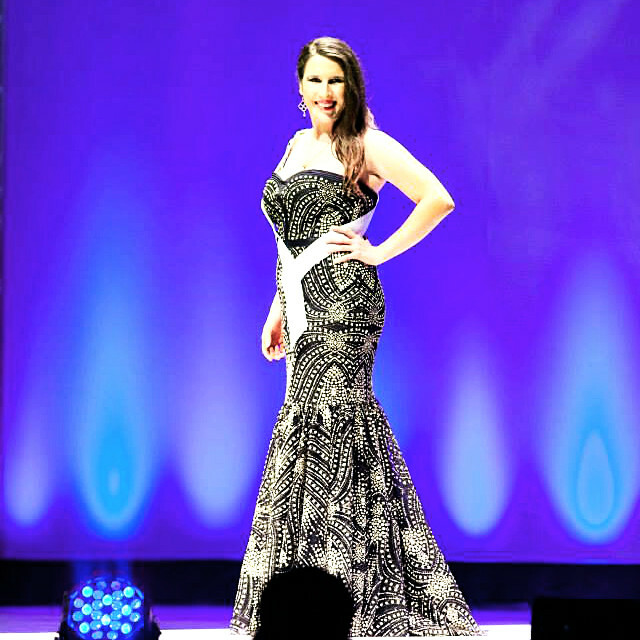 Kate Glazko shares the platform as a Miss California USA 2015 contestant to encourage minority participation in software. I am proud of my work on Fox Facts, an application meant to make it easier for contributors new to QA to find out information about their device: buildID, operating system version, platform information, and memory. In its latest iteration, it works with Firefox 2.0 and allows for one-click information gathering if using a development build including memory and other need-to-knows for filing a bug. A new version that will work with the Bugzilla API is moving into the development phase this semester. 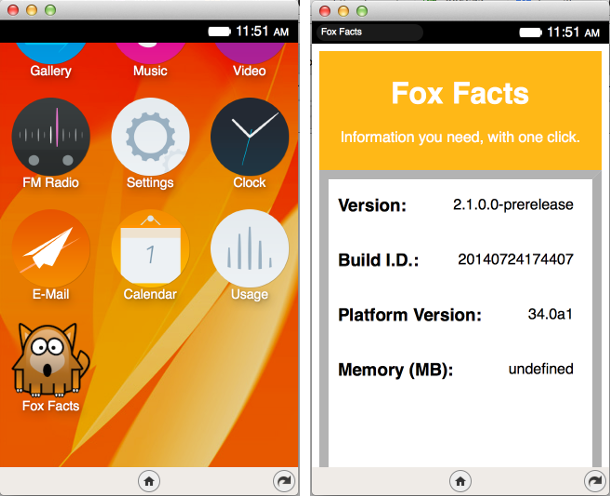 Screenshots of Fox Facts, a Firefox OS app written by Kate Glazko. What projects did you work on during your internships at Mozilla? During my summer internship in 2014 I got to work with Marcia Knous and Tony Chung in Firefox OS QA on an application. 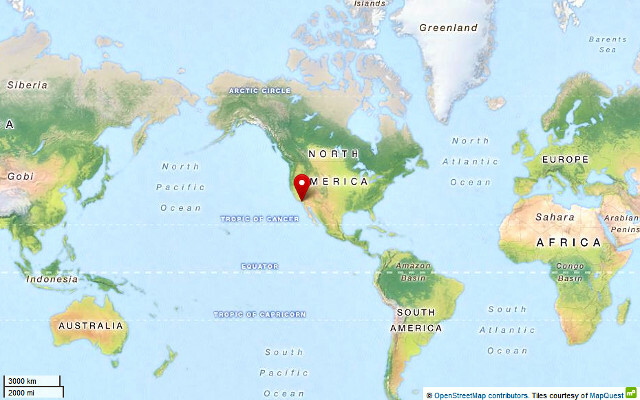 I helped create a test plan for Find My Device, which was new in Firefox OS 2.0. My work involved converting user stories into MozTrap test cases and test suites, running the tests on a daily basis, as well as investigating bugs. At the end of my internship I gave a presentation on Constructing a Test Plan End-to-End for Find My Device at the Mozilla Mountain View office. I also participated in the QA Fair held during the QA Work Week in July 2014 at the Mountain View office. I demoed the Find My Device app to members of the public who attended the fair. Karl Thiessen, Dylan Wong and Kate Glazko demo ‘Find My Device’ at the QA Work Week, July 2014. During my summer internship in 2015 I worked in Release Management with Liz Henry on projects that included a release survey and a redesign of the Release Notes front-end. Kate Glazko with the Release Management team at the Mozilla Work Week in Whistler, June 2015. Get IRC and jump in! Don’t be afraid to ask for help, and check out One and Done tasks. I am excited to see how Firefox OS continues to influence the smartphone landscape, and how I can help. Thank you, Mozilla, for the opportunities to learn so much! 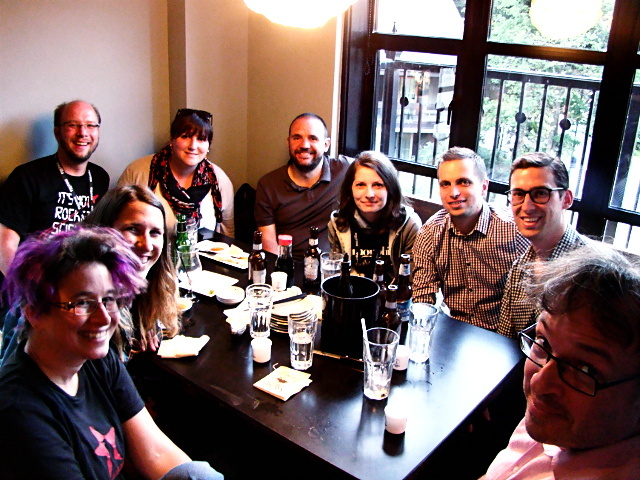 The Mozilla QA and Release Management teams would like to thank Kate Glazko for her contribution over the past 1 year. I had a great time working with Kate this summer. She jumped into developing tools with the Bugzilla and Socorro APIs, re-wrote the front end code for Firefox’s release notes, and triaged critical bugs with the release management team. Kate is relentless in her approach to problem solving in projects — always up for a thoughtful discussion of technical issues, user experience and design, or business and the tech industry. We have a lot of fun too, hanging out in person and on IRC. I am glad to have worked alongside Kate this summer, who is also a fellow Trojan! 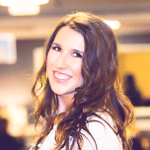 She is extremely passionate about technology and women’s role in it. I have seen her take on diverse tasks like scripting, project management, bug triaging and driving them to completion successfully. I would attribute some of this success to her double major, which is quite a feat! Our team benefited from many of her ideas like post-release survey, release notes UX design revamp while keeping in mind the nuances of UI design on mobile devices. She also jumped in to help with the ESR release and took on some release tasks which she drove independently.